In today’s competitive marketplace, stamping-die designers and developers need the right tools to be successful. Die design, development and simulation software automates the process while providing engineers with the control they need. 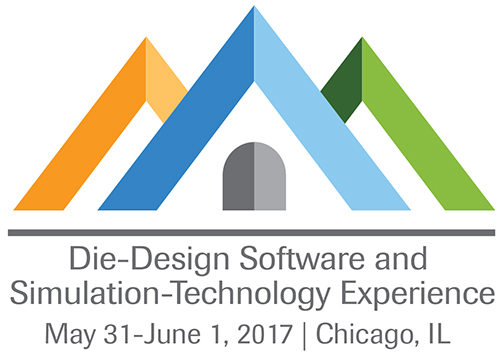 Catch up on all of the most recent developments in die-design, development and simulation software at the sixth annual Die-Design Software and Simulation-Technology Experience, presented by MetalForming magazine and the Precision Metalforming Association. Here’s some of what’s on tap for this two-day event. Schaeffler will describe how a tensile test is performed, how the results are generated and how these parameters are calculated. He will cover the influence of Rockwell hardness on sheet formability, and attendees will learn the importance of n-value (no sheetmetal product has one singular n-value). He’ll explain what goes onto a cert and the notations you should look for to ensure that you are getting what you ordered. And, you'll learn that while elongation may be reported on every cert, it may not tell you anything about when the stamping will fail. Finally, he’ll discuss different sheet-steel grades and aluminum alloys, and highlight the characteristics that impact formability. Schaeffler supplements his materials-focused presentation with a talk on forming limits and the forming-limit diagram (FLD). “A true understanding of simulation results and corrective actions is not possible unless the forming-limit curve is well understood,” he stresses. While a tensile test characterizes how a material in the shape of a dogbone behaves in tension, it doesn’t replicate the deformation experienced during the stamping of a particular part. The strains seen in every location on the stamping can be measured and compared with simulation. The first step in processing a progressive die is to develop a strip layout. All too often only one strip layout is created. Even if several strips are developed, how does one determine which is best? This discussion, led by PMA technical director Peter Ulintz, centers on how metalformers and die designers can rank strip layouts so that the best possible strip design is chosen. Strip layouts directly affect the final size of the die, initial die cost, die maintenance and repair cost, press selection, press maintenance and repair costs, initial stamping cost, in-process reliability, dimensional accuracy of the finished part, and the cost of poor quality. Up for discussion: A numerical ranking system for evaluating and selecting the best strip layout. Evaluation scores can provide die engineers and process engineers with performance-based rankings for evaluating several strip layouts for the same part. Because the evaluation scoring has relative meaning for different layouts producing the same part, it can be used to find the best solution for that particular part. Schaeffler will describe how to create an FLD, and the various techniques used to measure surface and thickness strains in the laboratory and in the field. He’ll then present the different approaches to counter failing parts. The discussion then turns to the impact that material has on a designer’s approach to die design. Learn from Peter Ulintz, PMA technical director, how material type, thickness, grade and temper specified for a given stamped part will greatly influence how the die should be designed and built. 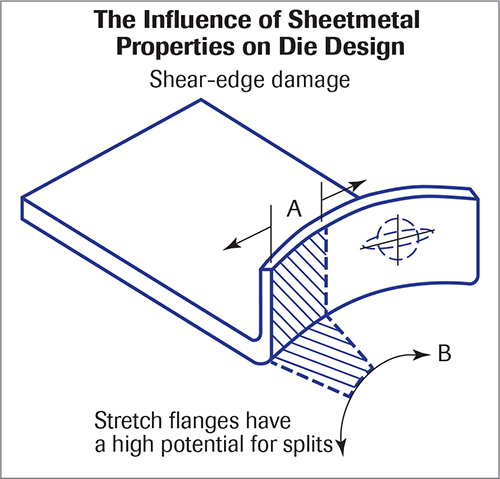 It’s important to note that many rule-of-thumb guidelines used by die designers and toolmakers over the years may not be appropriate when developing tools for newer steel grades. “For example, it has been a common practice for designers and toolmakers to apply 8 to 10 percent per-side cutting clearance for cutting and punching processes,” Ulintz says. “This may be an ideal clearance for mild steel, but it can be the worst possible clearance for many other steel grades in terms of burr height. Materials with low yield-to-tensile strength ratios, including many high-strength steels, require greater punch-to-die clearance to provide the mechanical leverage required to cleanly break the slug with a minimum burr. This requires increased attention to slug retention and scrap management in the die design. Springback compensation for high-strength steels and aluminum alloys also deserves careful attention, and Ulintz will address this during his presentation. And, some product and addendum geometry suitable for deep drawing of mild steel will not work for many aluminum alloys. “Simple things like draw-bead profile design requirements can vary greatly between temper grades within a single alloy,” he says. Simulation of drawing, springback, springback compensation, hydroforming, forging, trimline development, superplastic forming and hot forming. Advantages and limitations of simulation software. Differences between incremental and one-step solvers. A discussion of the explicit and implicit simulation methodologies, and element/time-step/mass scaling/dynamic effects. “With increases in computing speed,” He-Dubois says, “the inevitable trend is the merging of simulation into the CAD environment. 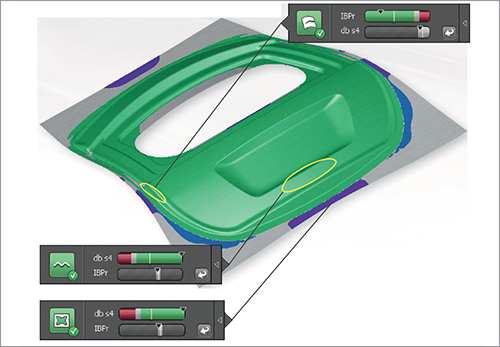 Designers now use simulation technology directly as they design a tool. Some CAD packages already have merged one-step analysis into their design flow, and it’s just a matter of time before incremental analysis will be inside of every CAD package. Adithya Ramamurthy, an application engineer at AutoForm Engineering USA, follows up with a discussion on using virtual simulation to identify potential forming issues that might occur during tryout and production. A subsequent trial-and-error approach can lead to identifying solutions to the forming issues encountered during evaluation of a simulation. Ramamurthy will describe the use of systematic process improvement (SPI) and a robustness check of a virtual stamping process. Learn how new simulation software employs automated/manual issue detection to identify local forming windows, and then proposes a combination of design variants to address these issues. Eric Bragg, VP/sales engineer, TST Tooling Software LLC, then takes the stage to highlight software capabilities associated with developing initial die costs and piece-part costs. Bragg will describe the latest software features that help diemakers streamlines quoting, develop more accurate cost estimates and generate professional-looking customizable quotes. You’ll learn how to quicken your quoting process, produce more accurate estimates and better manage your quotes. Lastly, Bragg will demonstrate how to quickly turn quotes into jobs, with automatically generated bills of materials, and with software fully integrated to work with existing CAD software. This presentation highlights die simulation/animation technology and its application, including collision detection. Ray Proeber, president and owner of Accurate Die Design Software, Inc., will describe how progressive and transfer dies can be simulated in various press types such as conventional, servo and link-motion. Fineblanking, fourslide, multislide and Bihler machines also can be simulated. Attendees also will come away with a good understanding of slide-tipping prediction and reverse-tonnage loads. When it comes to simulation, or looking at die kinematics, Proeber contends that a dozen years ago, die simulation merely was animating what would happen in a die, without any true interaction between the die components or even with the die components and the strip. Today, several simulation-software packages display very realistic die-operating conditions. “Some of the software,” Proeber says, “can duplicate the conditions taking place in a 20-ft.-long transfer die, right down to predicting press speed for a given die, even before it hits the press. The tools within the software even account for velocity and acceleration. Last but not least, all of the lessons learned come together with this case study presented by Peter Ulintz. This case study demonstrates how draw beads can help constrain material flow locally during the forming process. In addition, excessive thinning was observed where the vertical wall of the part was deep-drawn. In order to increase the minimum thickness of the drawn part, the blank was trimmed where the flange remains large after forming, to allow the material to flow more readily into the die cavity. At the same time, the blank was optimized by saving 35 percent from the original blank size. The minimum thickness was improved by 10 percent.